The Fox Network is ending the 15 season run of American Idol, and they seem to be in a rush to get the show off the air, since the last show will be April 7. The season finale was on May 13 for Season 14, so Fox is ending the show a month earlier than usual this season. Apparently, Fox wants to get rid of American Idol in time, to push new shows for the May sweeps. There will be no judge’s save this season, which had delayed the completion of the season in the past. The current judges Keith Urban, Jennifer Lopez and Harry Connick Jr. have the best chemistry to me at least, of any previous judging panel. They definitely are better than the Season 12 judging panel, when Mariah Carey and Nick Minaj clashed and trashed each other. Still not sure what American Idol was thinking when Ellen DeGeneres was a judge in Season 9 and Season 10. DeGeneres had to be the most unqualified judge in the history of American Idol. A comedienne judging singers was not a good idea. I started watching American Idol during Season 2, and I have been hooked ever since. I tried to watch The Voice, but usually only watched till the chairs spinning around episodes ended. I like the way American Idol features their finalists every week, while The Voice finalists were seen more sporadically. 10.96 million viewers watched the first show this season, but the last episode drew only 8.19 million viewers, which has been the season low so far. Season 2 drew a record 38.06 million viewers for the finale. Season 14 only had 8.03 million for the finale. The Voice attracted 12.69 million viewers for the Season 9 finale. However, the difference maker for me is that American Idol winners have been more successful, than The Voice winners. Those who never watched The Voice probably have never heard of any of the nine winners. American Idol on other hand has Grammy winners and Oscar winners among their winners. Kelly Clarkson and Carrie Underwood have been the most successful American Idol winners, but Chris Daughtry, who didn’t win has sold many millions of albums, since he left the show. Meanwhile, Cassadee Pope maybe the most recognizable winner of The Voice has not sold that many albums. Her album Frame by Frame sold about 181,000 albums and it is listed 15,865th in music sales at Amazon. I would like to see a winner from The Voice become a mega star like Kelly Clarkson and Carrie Underwood, but it hasn’t happened yet that I know of. After all, the goal of these shows is to help singers break into the music business in a big way, but The Voice has lagged behind American Idol in this department. Scotty McCreery the Season 10 winner has made a big impact on country music, and his debut album Clear As Day was the first debut album, by an American Idol winner, to reach #1 on the Billboard 200 chart, since Ruben Studdard had reached #1 in 2003. The final curtain will come down on American Idol in 45 days, and it will be a sad day for longtime American Idol fans. It will be an even sadder day for aspiring singers, since there will be one less musical competition show, for them to get that big break, that might jumpstart their career. American Idol RIP…..It ended way too soon. and Harry Connick, Jr., with Ryan Seacrest who has hosted the show since its inception. American Idol started its 14th season, by drawing 4 million fewer viewers, than they attracted for the first show of Season 13. That was a decline of 25 percent from the Season 13 premiere. The show reached its peak in Season 6, when they attracted 37.44 million viewers for the premiere that year in 2007. The premiere this year attracted 26 million fewer viewers, than watched the show in 2007. Randy Jackson, who was a mentor during Season 13 won’t be seen in Season 14, unless it is in a guest appearance, since he is no longer employed by the show. There should be no Coca-Cola cups at the judge’s table in Season 14, since Coca-Cola no longer is a sponsor. The Voice on NBC has attracted more viewers recently, than American Idol, but The Voice has had less success in launching careers of their winning contestants. Season 8 of The Voice premieres on February 23, 2015, so the two shows will be on different nights. I have watched American Idol since Season 2, so will probably go down with American Idol ship, when it sinks out of sight in the next year or two. I like the chairs turning around gimmick on The Voice, but not a fan of the battle rounds competition. Not to say it isn’t a good show….it is just my loyalty to American Idol supersedes that of The Voice. Why It Looks Bad: The American Idol champ’s debut was buoyed by a hit single, “Home,” something his second has yet to produce. And more than a regular artist, people expect a sophomore slump from an Idol champ — so his low first-week tally wasn’t a good look. Counterpoint: Like 50’s album, the year-to-date total sales for Behind the Lightaren’t terrible. In fact, with the holidays approaching, sales for Phillips’ second are higher than they’ve been in weeks, suggesting there’s life in the album yet. Scotty McCreery is now 21, after winning Season 10 four years ago. His album and single sales have done well, with him his first album Clear Day going platinum and his second album Christmas With Scotty McCreery earning a gold album certification. The album debuted on Billboard 200 at No. 24 with 11,000 copies sold in its debut week, giving him the distinction of having the lowest first week sales and inaugural chart position of any American Idol winner.Johnson also has the distinction of being the first American Idol winner to have their Idol coronation song, “As Long as You Love Me,” fail to chart on the Billboard Hot 100 charts. On the other hand Kelly Clarkson has released six albums and all six have gone platinum and have peaked at either #1, #2 or #3 on the album charts. She has recorded four #1 hits. Carrie Underwood has recorded 12 #1 hits on the country charts. It doesn’t seem possible that it has been 10 years, since Carrie Underwood won Season 4 of American Idol in 2005. All four of her albums have gone platinum. It is hard to believe, that she hasn’t recorded an album since 2012, so we should see another Carrie Underwood album released, in the not too distant future. Her 12 #1 hits is the most recorded by any of the American Idol winners. 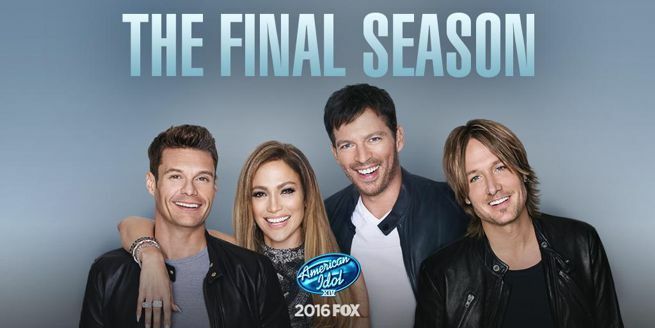 The Fox network will be shortening the Thursday night results show of American Idol, to half an hour in Season 14. It will be a welcome relief, to American Idol fans, who were tiring of all the filler used in the results show in past seasons. Ryan Seacrest won’t have so much time to stretch out the drama, of who will be going home that night. Ryan Seacrest has promised that Season 14 will have great talent, but American Idol fans will believe that, when they see and hear the shows. I personally believe this is the best set of judges since the debut of the show. It will be nice to not hear “Yo dog” and “In it to win it” in Season 14, even though we didn’t hear it in Season 13 either. It is a huge improvement over the train wreck of a judging panel, when Nicki Minaj and Mariah Carey took their battle public and overshadowed the contestants, by their constant bickering. The back stories for the contestants are what make American Idol so great in my book. Like the blind man, who sang a Spanish song for Jennifer Lopez on last week’s show. He may not be the next American Idol, but he will be one of the highlights of Season 14 for me. So far this season the focus has been more on the talented singers, and less on the singers who have no talent. We know the judges just see a small percent of the singers, since they have others, that weed out the less than prime-time ready singers. The Voice may have passed American Idol in the ratings, but American Idol will be the show I watch, till it fades out for the last time. By this time next year we should know if Season 14 has produced another Caleb Johnson or another Carrie Underwood, or a singer somewhere in the middle of the two singers. American Idol Season 13 bottomed out this season with only 7.63 million viewers for their Top 8 results show last Thursday. Season 13 drew 15.19 viewers for their debut this season. That is a drop of approximately 7.5 million viewers 27 shows into the season. The 2003 Season 2 finale drew the largest audience for a premiere or finale, by attracting 38.06 million viewers. Compare that with the 7.63 million viewers last Thursday and that is a drop of almost 31 million viewers. January 13, 2009 was the last time that a premiere, final performance or season finale show drew over 30 million viewers. The May 23, 2012 finale was the last time American Idol attracted more than 20 million viewers. March 12, 2014 was the last show to draw over 10 million viewers for a Season 13 episode. I think one problem this season is that Season 13 has few good singers. 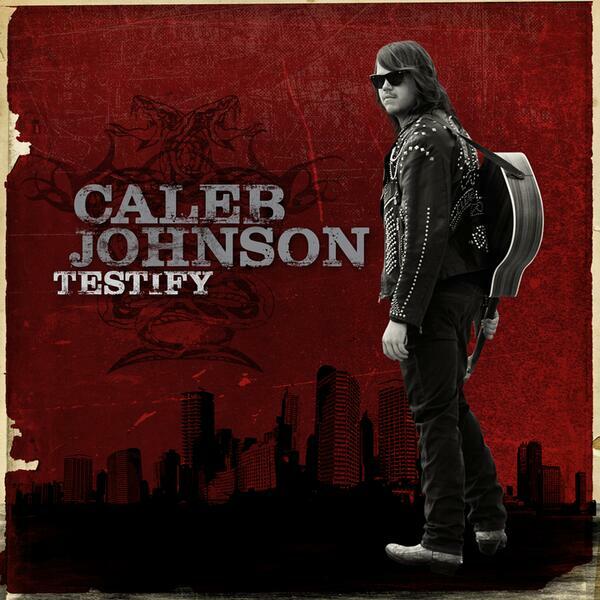 I look for Caleb Johnson to be the next American Idol. If not him, then it might be Jena Irene or Jessica Meuse. C.J. Johnson will probably go home on Thursday night, unless he has a superb performance on Wednesday night. The judges this season Harry Connick, Jr., Jennifer Lopez and Keith Urban have been refreshing, after the feud between Mariah Carey and Nicky Minaj took the focus off the contestants in Season 12. This could be the right time to end American Idol. Ryan Seacrest will probably not be paid $15 million a season again and Jennifer Lopez is scheduled to do a cop show, so can’t see her having time to do American Idol, due to the filming schedule of a weekly series. Seacrest is probably ready to move on to other jobs and American Idol ties him down during the auditions and regular season and he sure doesn’t need the money. It is time to end the show before its ratings fall even further behind those of The Voice. The premiere of The Voice was shown on April 26, 2011 and drew 11.78 viewers. Season 2 drew 37.61 million viewers due to Super Bowl lead-in. Season 3 attracted 12.8 million viewers for premiere. The Voice drew about a million more viewers, for each year and this year attracted 15.86 million for the premiere. Season 4 finale night for the June 18,2013 drew 15.59 the most ever for a finale. The finale night for Season 5 on December 17, 2013 fell to 14.01 viewers, so it will be interesting to see if Season 6 finale ratings fall below that number. Season 6 ratings have fallen from a season high of 15.86 million, for the premiere of the Blind Auditions on February 24, 2014. Last Tuesday’s episode drew 11.08 million, which is a dropoff of about 4.78 million viewers. If The Voice and American Idol were aired in the same time slot, then it would be almost a certainty that American Idol would be clobbered. The interplay between coaches Blake Shelton, Shakira, Usher and Adam Levine has been, in my estimation a big part of the success of The Voice. It is fun to watch them beg for the contestants to choose them, as their coach and belittling the other coaches in the process. It is a more of a fun show than American Idol. I haven’t watched during the battle rounds and playoff rounds, so I can’t say how good the singers on The Voice are. I will resume watching when they start the live shows and will get a better idea of who the best singers are. The Voice is the king of the singing competitions and may find itself the only singing competition, if American Idol ends its 13 year run after this season. American Idol started Season 13 back on January 15, 2014. 15.19 million viewers tuned in, to watch the 2014 premiere of the long-running singing competition show. By the time Episode 17 aired on September 6 the ratings had fallen to 9.76 million viewers, which was a drop of 5.43 million viewers from the premiere episode. The Voice opened Season 6 with 15.86 million viewers and by the time the sixth episode had aired on March 11 the ratings had fallen to 13.51 million viewers. That was a drop of 2.35 million, which made The Voice the winner in attracting viewers so far this season with The Voice holding on to more of the viewers from their premiere, than the American Idol was able to do. It is too early in the season to tell which show has the better singers, but right now I would give a slight edge to The Voice, since they have 48 singers still in the competition, while American Idol is down to 11 singers left. The blind audition rounds to me are what really interest me, since it is always fun to watch the coaches turn around or not turn around for a contestant. It is fun to watch the interplay between coaches Adam Levine, Shakira, Usher and Blake Shelton, as they unashamedly beg the contestants to pick them as their coach. I think the current panel of coaches is the best, since there seems to be better chemistry, when Christina Aguilera and Cee Lo Green (who won’t be returning) are not on the show. The Voice begins the battle rounds on Monday, March 17 and they will end on March 25. I have never been a fan of the Battle Rounds, since it seems to me, to be more of a contest, to see who can hit the highest note. The battle rounds can eliminate contestants, because they may have to sing a song, that doesn’t best showcase a particular singer. So once the Battle Rounds are over and the live shows began will begin to watch The Voice again. I dislike the fact that a singer chosen by a coach in the first episode of the Blind Auditions might not even be seen,, till 8 or 9 weeks later. If The Voice returns this fall it won’t face any other competition, from other singing shows, since X-Factor won’t be returning this fall. American Idol to me better promotes their contestants, with them being on every show, after the Final 13 have been chosen. We learn the contestants easier, because we see them singing week after week. After next Thursday’s results show on March 20 there will be only 10 contestants left. 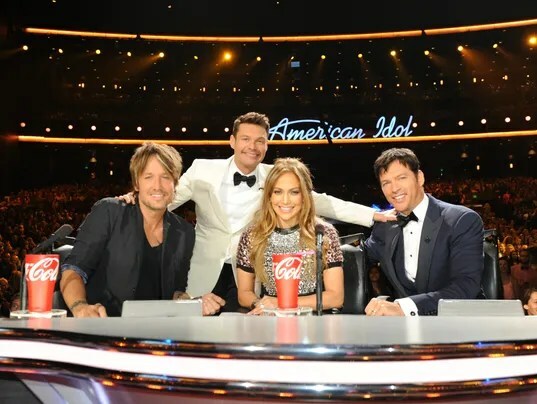 I don’t think American Idol could have hired better judges than the trio of Keith Urban, Jennifer Lopez and Harry Connick Jr. You can see the compassion the judges have for the contestants. Harsh Harry as Harry Connick Jr. has been called seems to be the sterner of the three judges. Jennifer Lopez will reportedly have her own detective show on NBC next year, so that will probably mean she won’t be returning for Season 14 next January. Ryan Seacrest contract for three years for $45 million will end after the last show airs in May. It remains to be seen if he will return, or if American Idol will even return for Season 14. American Idol has lost its invincibility factor, as The Voice has proven it can draw more viewers consistently. American Idol attracted 10.11 million viewers last night, which was only bettered by Criminal Minds with 10.72 million viewers. While American Idol may be slipping in the ratings it still is drawing well, when compared to the viewers watching shows on the other networks. The Voice is outdrawing American Idol by three or four million viewers, so they are the king of the singing competition shows, unless American Idol can reverse its downward trend in the ratings. Simon Cowell’s X-Factor USA has been canceled after three seasons. X-Factor USA never really caught on with American television audiences, so Simon Cowell is heading back to England, after failing to make the show relevant in the United States. Cowell had predicted before the start of the first season, that X-Factor USA would draw 20 million viewers. The handwriting was on the wall for the show, after the ratings fell 6 million from the first finale to the third finale. The judging panel changed each season, with Cowell being the only judge on the panel for all three seasons. Nicole Scherzinger may have been the worst judge, ever in any singing competition, when her indecision forced the panel into a deadlock, which caused Rachel Crow to leave the show. She was dismissed from the panel, after Season One, but amazingly was made a judge on the British version of X-Factor. Steve Jones in Season One was the most ill at ease host I have ever seen on a television show. He became visibly upset, when he was trying to rush the judges, when making their decisions. Mario Lopez could have done fine in Season Two, without Khloe Kardashian, who seemed out-of-place on the show. It was evident that Cowell saw that Lopez didn’t need any assistance, as he let Lopez host Season Three alone. Season One – Melanie Amaro was announced as the first winner of X-Factor USA in December of 2011, but here it is February of 2014 and her debut album has never been released. If I remember correctly the Season One winner was supposed to receive a $5 million recording contract. Now it is doubtful if she will ever release her debut album, with the show no longer in production. Season Two – Tate Stevens unlike Amaro had his debut album released only four months, after being declared the Season Two winner. His album has received rave reviews at Amazon.com with 63 reviewers rating his album, with five stars while only two reviewers gave it one star. However, the album is not selling well at Amazon and is currently ranked as of today, as 27,339th in music sales. Season Three – Alex and Sierra were the last winners in the history of X-Factor USA, but it will be interesting to see, if they ever release a debut album. X-Factor USA winners have not made much of an impact on the American music scene and most people probably couldn’t even tell you, who won in any of the seasons. Singing competition shows should be measured, by whether the winners become household names and go on to be recording stars. X-Factor USA has failed miserably, when it comes to getting the names of their winners, to the point that American Idol winners have of being instantly recognized. American Idol, while its ratings are trending downward still has the most name recognition of either X-Factor USA or The Voice. Even Cee Lo Green of The Voice has conceded, that The Voice has not launched a big name on the music scene as of yet. Nobody will take The Voice seriously until one of their winners reaches the status of American Idol winners like Kelly Clarkson and Carrie Underwood. Some American Idol contestants, who didn’t win their season have gone on to be successful like Jennifer Hudson. She finished 7th on American Idol during Season 3 and went on to release two Gold records and win an Oscar for her role in Dreamgirls and won a Grammy for her debut album Jennifer Hudson. Chris Daughtry also has been a successful recording star, despite finishing 4th in Season 7 of American Idol. His debut album Daughtry has sold close to 5 million and it has gone quadruple platinum. When The Voice can produce stars like American Idol it will gain credibility as a star-making singing competition. In summary, X-Factor USA tried to match the popularity of American Idol and The Voice and fell far short of that goal. The Fox television network only has two hours of programming each night, so they couldn’t afford to let X-Factor take up 3 or 4 hours a week, on their network. Fox network is probably happy to concentrate, on American Idol now and try to stem the loss in viewers of that show.